Here’s a look at the Carlos Campos Menswear Fall 2014 presentation behind the lens of photographer, Nannette Leigh. In this all-navy set, the guys are sporty chic in leather biker jackets and graphic printed sweatpants. We’re crazy over the belted coats and surprise pops of white throughout the collection too. In these gorgeous shots, models Travis Smith, Yannick Abrath, and Paul Boche are fitted in menswear perfection. We even got a few snaps of designer Carlos before the presentation began. Lovely. Suits are tailored wonders and the hats are too hip for words. Love the triangle print that appears on scarves and pants like a hidden surprise. This muse can dress up or down, no matter the occasion. Give him a cup of tea or meet him on the golf course—no worries, he’s versatile. Plus, the horse printed sweaters are a fun, but masculine, touch. This was a treat during the busy week…always a pleasure to see menswear done well. We look forward to what this designer will be showing us next. If only next time wasn’t months away! This will hold us over until then. 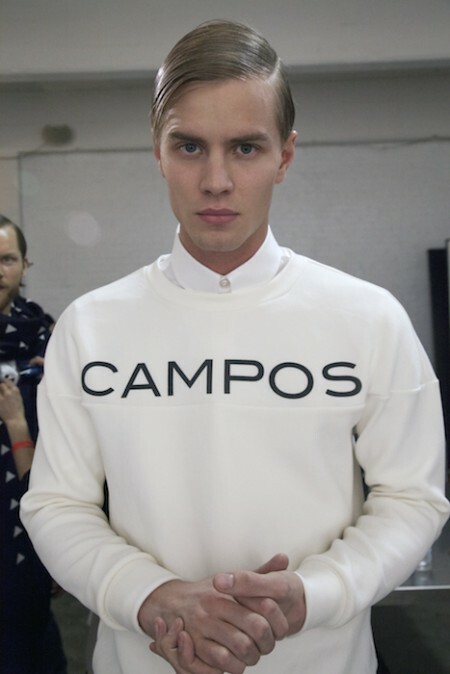 fdmLOVES CARLOS CAMPOS Fall 2014 selects by Brigitte Segura, written by Allison Ripa.